To racing fans around the world, Cosworth is a name that surely brings up memories of some amazing engines including the legendary Ford-Cosworth DFV V8 in Formula 1 and the derivative DFX in Indy cars. 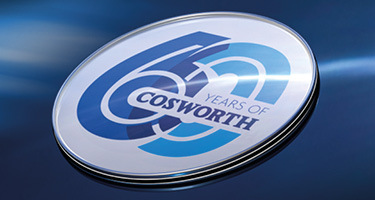 Founded in England 60 years by Mike Costin and Keith Duckworth, Cosworth also has a long history of working on wide variety of production programs for a wide range of manufacturers. 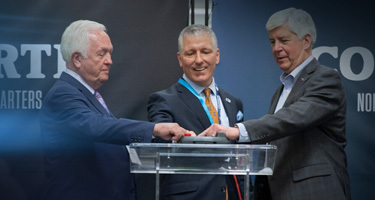 The company inaugurated its new North American headquarters and factory on June 25, 2018 and announced an expansion into developing sensing systems and software for automated vehicles. The new offices and factory in Shelby Township, north of Detroit are just the beginning of an expanding presence here. Right now, the plant only has a single manufacturing module with 14 CNC machining units, 6 robots and other related equipment. The first product coming from the facility are the cylinder heads for the recently announced 4.2-liter twin-turbo V8 that debuts in the 2019 Cadillac CT6 V-Sport. Cosworth’s new Shelby Township, Mich. factory is producing cylinder heads for the new 4.2-liter twin-turbo V8 for the 2019 Cadillac CT6 V-Sport. “By the end of 2019, the plant will add more equipment to expand capacity for this and other derivatives,” said manufacturing engineer, Ken Bowers. While no one from Cosworth would comment on future products, at least one derivative of the Cadillac V8 is expected to be a more powerful version for use in the long-rumored mid-engined Corvette (aka the Don Sherman edition). Cosworth has been developing and producing parts and complete engines for a range of manufacturers throughout most of its history including the famous 2.0-liter twin-cam four-cylinder in the mid-1970s Chevrolet Cosworth Vega and cylinder blocks for Aston Martin’s V12 engines. When Cosworth was acquired from Ford by Jerry Forsythe and Kevin Kalkhoven in 2004, it was combined with Pi Research. Pi had been a major supplier of electronic control systems including telemetry, data acquisition and ECUs for racing cars. Cosworth Group is now hoping to leverage that electronics expertise to become a player in the burgeoning automated driving space. For the past several years, it has already been producing its AliveDrive system which has been available in several General Motors products including the Corvette and Camaro as the Performance Data Recorder. This system takes the input signals from the forward looking camera for lane departure warning and combines it with vehicle data and inertial sensors to enable drivers to record both video and data while driving. The AliveDrive system will be expanding to other automakers in the near future. Cosworth’s AllDrive Platform is the basis for the Performance Data Recorder available in the Chevrolet Corvette and Camaro. Over the past two years, Cosworth has worked with other sensor providers to developing integrated solid-state sensing modules that combine, cameras, lidar and eventually radar for automated vehicles. For now, Cosworth doesn’t intend to develop its own lidar sensors. Instead they will focus on hardware and software integration with the sensors, computing chips and fusion algorithms to provide automakers with a robust, low-power and hopefully lower cost solution.